Around the middle of last year, I came to know that Chef Stephane Istel was leaving DB Bistro and was going to open his own restaurant. I heard from other chefs and even from Shermay to look out for his restaurant and the food from this talented chef. I took the comments with a pinch of salt as I have eaten a few times at DB Bistro and while the food was good, it was never really wow for me. Fast forward two months, I had lunch at the newly open Bar-Roque with my dad and two business associates. What a surprise and treat it was! Every dish that came to the table was oh-so-good and everyone had nothing but great things to say about the food. I thought the whole experience was further enhanced by Chef Stephane who came out of the kitchen and animatedly explains his daily specials. Soon after that lunch, I made a dinner reservation so that I could share my new found joy with my wife and friends. As I predicted, they all loved the food and now Bar-Roque is a regular place my friends and I go for meals when we do eat out. My theory is that at DB Bistro, Chef Stephane was confined to what dishes he could cook. At his own restaurant, he cooks dishes that he know are what he does best, something close to his heart and seasoned with lots of passion and love. Enough about my theories, its time to share with you some of my favourite dishes! Bar-Roque is located at the corner of Amara Hotel in Tanjong Pagar. 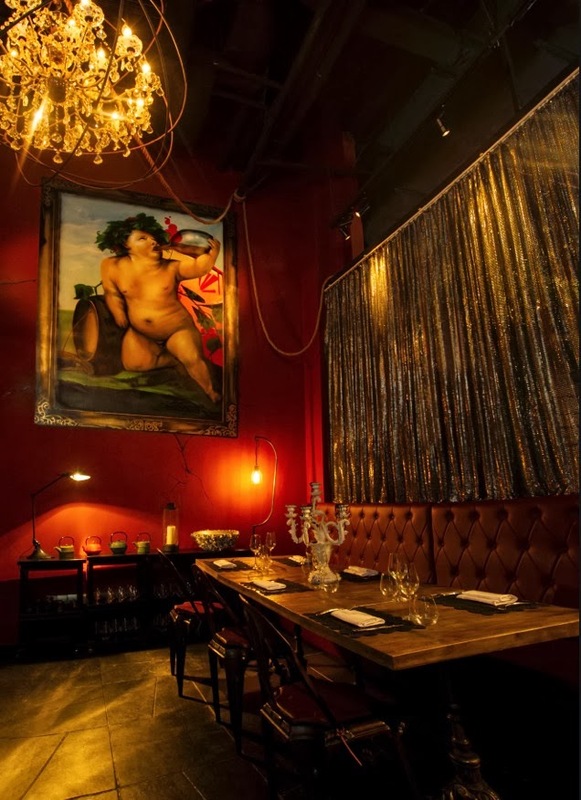 Its décor reinterprets the social exuberance of the Baroque era in a contemporary idiom, with sophisticated wallpaper and fine leather contrasted with naturally textured stone and wood, iron and brick. It has an open kitchen and a chef’s table right beside the kitchen where you have full view of the action. If you want the chef’s table, make sure you book early and ideally you have a table of 8 – 10 persons. 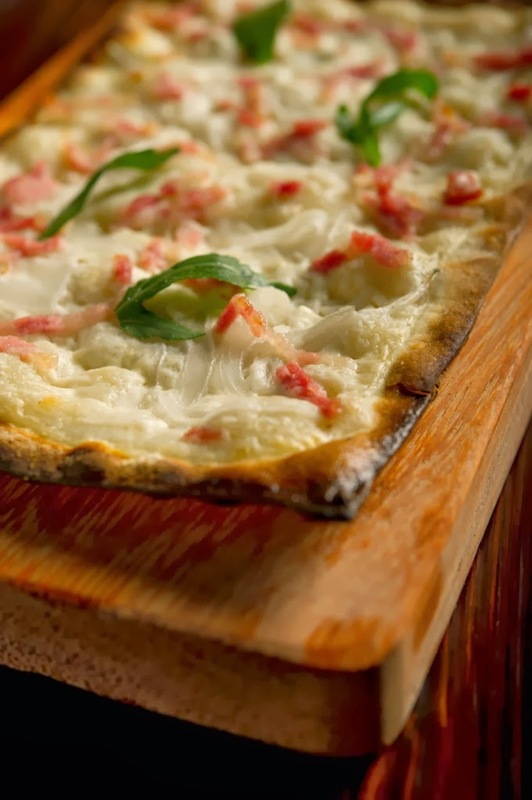 I always start my meal there with an order of tarte flambée (Flammkuchen in German) which is like France’s version of pizza. I usually order it first before deciding what I want to eat and drink so it comes just after I have ordered my food. The rectangular shape tarte consists of a really thin crust and topped with fromage blanc or crème fraîche, thinly sliced onions and bacon. You can also have it with escargots on it. It is so simple but so good. I really enjoy the meat platter here which constantly changes. It is a good time to point out that there is large rotisserie in the kitchen which is used to cook rotating skewers of poultry, beef, lamb and pork. 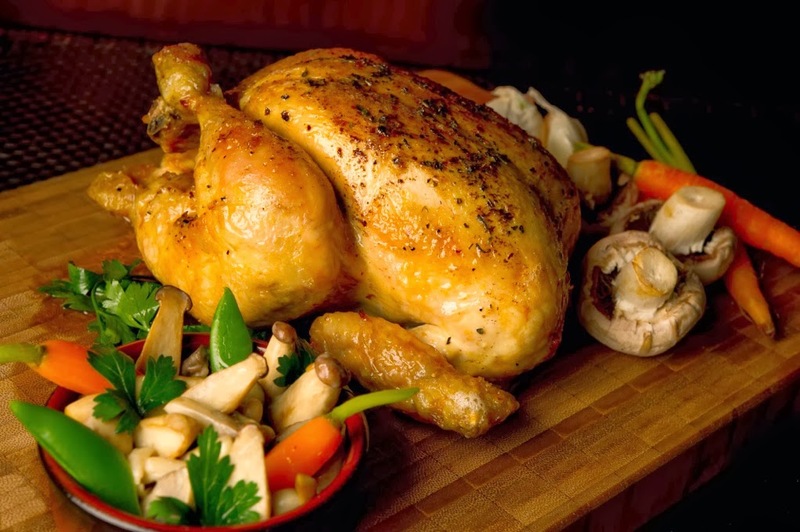 The rotisserie chicken is really juicy but I usually get the meat platter so that I can have a variety of meat including the chicken. Every meat that I have eaten on the platter, be it duck, chicken, poussin, steaks, lamb leg, kurobuta smoked ham, pork knuckle have been excellent. Just last week, Chef Stephane told me about a special he had which is ravioli stuffed with braised beef short rib and topped with jus and shaved black truffle. At the same time, I wanted the wagyu onglet (hanging tender) which normally comes with other sides and there was no way I could finish the two dishes so what he quickly proposed was that he serves the ravioli with the wagyu onglet. I loved the fact that he could decide and initiated to combine the two dishes. Needless to say I enjoyed the dish so much. Another dish I usually have to share is the Ravioles “Royan”. No not ravioli which is a traditional Italian stuffed pasta but ravioles, a specialty of the Dauphiné region in the Rhône Alpes in France. The concept is the same- stuffed pasta- but these ones are tiny and filled with a blend of cheeses and herbs. The ravioles is served with cream and cheese, “au gratin” style, and bursting with flavour. Usually I am too full by the time it comes for desserts. However I cannot resist having a dessert tarte flambée which is served with banana and nutella. It is not too heavy but yet gives a truly sweet ending to a delicious meal. Another dessert to try if you like dessert is Chef Stephane’s mum’s apple pie. Like the décor, the restaurant’s food expresses a grand appetite for life. It is refined yet hearty, traditional yet innovative, and bursts forth from the passionate classic-contemporary soul of Chef Stephane Istel. Best of all it won’t burn a hole in your pocket!